We are a busy and incredibly friendly school with lots going on. This website aims to give you a taster of the school, as well as providing regular updated information for both parents and pupils. We have tried to encapsulate the special qualities that our school offers and hope that it conveys the happy and secure atmosphere that all our children are able to enjoy. Our children are our pride and joy and ensuring that every child is happy and given the opportunities to achieve their potential is our priority. We carefully track the progress of every child, taking immediate steps to support any child who may be finding something difficult. We have a reputation for being a very successful, happy and inclusive school, with Christian values underpinning our ethos and teaching. Every child is valued as a unique individual. Our half termly value is embedded into assemblies, general classroom discussions and work, as well as being displayed in the school hall. We have high expectations which lead to excellent academic achievement and ensure that every child will reach their full potential in their personal, creative, physical, moral and spiritual development. We hope that you enjoy browsing our website and that you find all the information you are looking for. 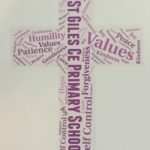 Like most websites this one is hopefully a good source of information as well as showing parents, grandparents, friends, the wider community and the pupils past and present what an excellent school St Giles Primary is. We want our website to present a face to the wider world and give it a place within the Global Community. Although pictures and words cannot show exactly what our school is really like, hopefully it gives you some idea of what our children experience on a daily basis.